It's time for the Americans, Europeans, and citizens of other countries that observe daylight saving time to put their collective billions of feet down and say, "We won't change our clocks twice a year anymore. It’s insane, insane!" the years. Photo for the Library of Congress. Not every country practices the bizarre ritual of people running around their homes changing the time twice a year. Most Asian and African countries, as well as countries near the equator, don’t make their citizens hunt for clock manuals twice a year. Sensible, very sensible. I used to live in a house with a centralized phone system that displayed the time on each phone in our house. Unfortunately, the system, located in the basement, required intense concentration and 10 totally unintuitive sequential steps to reset the time. I considered leaving the system on Greenwich Mean Time all year round. The fancy and often flawed mental gymnastics needed to coordinate online meetings or phone calls with people in other countries because of the twice a year time change, which occurs in different countries on different days, causes dizzy spells. Take a moment and watch CGP Gray's funny and concise explanation of the unnecessary complications caused by our unnatural clock change. He points out, In the space of three weeks, New York is five hours behind London, then four hours and then five hours again. And Sydney is either 11, 10 or 9 nine hours from London and 16, 15 or 14 hours from New York.” That happens twice a year. At the very least, you’d think that there would be an international treaty making all countries that observe daylight saving time start and stop it it on the same day. Then there's the productivity thing: Springing ahead may sound lively and energized, but suddenly getting an hour's less sleep every March takes a $480 million toll on American productivity. Falling back, which Americans do on an unmemorable autumn Sunday at 2am, isn't as bad, but it still disorients our circadian rhythm, making it harder to fall asleep until our bodies adjust to the time change. Dog owners report that their pets want to eat breakfast and take a morning bathroom walk an hour earlier or later than right before the time changed. If you happen to be on an American Amtrak train on Sunday when the clocks fall back, your train will pause in an intermediate station for an hour till time itself catches up with Amtrak. In other words, your trip is going to be an hour longer. Obviously, not many people will be on a train on Sunday morning at 2am, but that just shows how messed up things get because of the time change. Needless to add, airlines can't pause their flights en route, so the biannual clock change makes airline schedules unnecessarily complicated. For watch collectors who keep some or all of their watches on time, this twice annual required time change is painful—literally, because adjusting the time on a dozen or more watches takes a toll on fingertips. Many of the world’s leaders are watch collectors, so there might be some political muscle to support a campaign to eliminate daylight saving time. Vladimir Putin has several watches, including a Patek Philippe Perpetual Calendar and Blancpain Leman Flyback. Prince William wears an Omega Professional Seamaster. Perhaps the Dalai Lama, who owns over a dozen Rolexes, can put a stop to this perverse distortion of the natural world. If you think that your computer can keep pace with this, you might be wrong. Even the iPhone has failed to get the date right for daylight saving time. More than once, iPhone owners who thought that their phone's alarm was going to wake them have overslept because the iPhone forgot all about the time change. In 2011, Russia declared standard time persona non grata and now they are be on daylight saving time all year round. Yay Russia! It can be done. 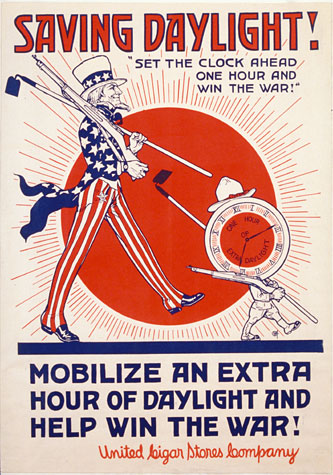 Interestingly, there's no US Federal law requiring a twice-a-year clock change. Two states, Arizona and Hawaii, have abandoned this insane practice. It's time to no longer change the time.